Update: We have a NEW coupon on Amazon! Need snacks? Look what we found for you on Amazon! Hurry and get the Pepperidge Farm, Goldfish, Crackers, Sweet & Savory, 19.5 oz, Variety Pack, Box, Snack Packs, 20-count today for as low as $5.98 from Amazon when you clip the 20% off coupon. That’s just $.30 per snack pack! Limit 1. Check out all of the recent Amazon deals here! Everyone loves Goldfish crackers – they’re tasty and fun! The variety packs are great for on-the-go snacking with individual serving sizes. When it comes to Goldfish crackers, you can feel good about serving your favorite snacks. All of our cheese cracker varieties, like cheddar, are baked with real cheese, and Goldfish crackers are always baked, free of artificial preservatives or flavors and a good source of fun. 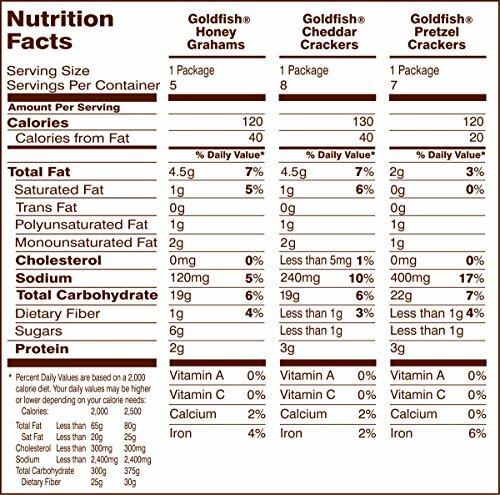 Buy the Pepperidge Farm, Goldfish, Crackers, Sweet & Savory, 19.5 oz, Variety Pack, Box, Snack Packs, 20-count from Amazon. Next articleNerf Rival Kronos Outdoor Blaster (Price DROP) – Limit 3!